On Christmas morning it’s easy to find our presents. 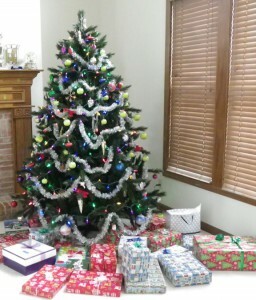 All we have to do is look under the tree and pick out the ones with the tags that say they’re for us. Life would be so much simpler if every day could be Christmas, wouldn’t it? But going through the rest of the year, it’s not so easy. Sometimes we really have to hunt for those presents. When we let ourselves get too busy to appreciate the moment, they can seem very far away. Life starts to feel like we’ve been slogging through wet grass looking for Easter eggs on a cold, rainy April day, but all we found was a bit of squashed chocolate that somebody stepped on. Of course, heaps of wonderful presents are all around us every day—sunshine and trees, family and friends, a good meal, a comfortable home. Getting too busy to notice them is like forgetting it’s Christmas and walking right past the tree without paying attention! Great reminder! Everyday can bring the joy of Christmas, and does, we only need to tune in to the good, rather than the bad. Merry Christmas! Thanks — I hope you’re enjoying the holidays too! This is a wonderful reminder!! Thank you for linking! Hi Becca — glad you enjoyed it! So true! We need to tune into the positive and discover all the gifts we actually have. Thanks for the reminder! Wishing you many beautiful discoveries in the New Year! Much appreciated, and Merry Christmas to you! Pingback: Nurturing Thurs – 2015 Blessings | "On Dragonfly Wings with Buttercup Tea"
Hi Meg, happy new year to you! We need to look and be grateful for all the gifts around us, nature’s gifts are the best.